Rather than use the Holiday gift card my company gave out to everyone on something sensible, I decided to indulge my inner child and acquire my first quad rotor. I’ve been thinking about buying a proper drone one of these days so I thought I should start with something more ... attainable. After doing a bit of research, I “landed” on WLToys’ model V686, a lightweight (no registration needed) but not tiny quad with 2.4 GHz controller and WIFI camera. There are a few versions of the V686 but I bought the “K” model that comes with mount on the controller for your iOS or Android app-supported device to use in FPV (first-person view) mode. The camera isn’t built into the chassis but rather clips to a belly mount. Interestingly enough, there are four ports on this quad: one 3-pin that the included 2MP (VGA 30FPS) camera uses, plus a 2-pin and 2 4-pin ports. Looking into this, I discovered that you can actually purchase optional devices that use the same mount as the camera. One is an upgraded HD camera that apparently captures sound with the video (mine doesn’t), one is a water squirter (! ), and the other is a bubble blower (!!!). The Phantom 3 might be the ultimate bad-boy drone but you can’t blow bubbles with it! Anyway, with two decent inaugural flights under my belt, I’ve got a pretty good bead on the pros and cons of this entry-level FPV Quad. FPV: This is a truly cool feature that usually only comes on true “drone” class quad rotors, or at least models that require FAA registration. 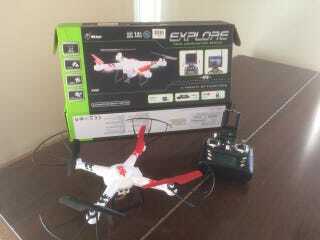 As you’ll see by the videos of my first two flights below, the video is far from perfect but serviceable for the price. I haven’t captured any stills yet but will on the next flight. I will say there is virtually zero video lag when flying in FPV mode, regardless of how far away it was. That kind of surprised me. Control: This is my first quad so I don’t have a lot to compare this to but the V686 seems instantly responsive. Durability: To be honest, this quad seems rather delicate when you handle it. It is so light, it gave me the impression is would shatter upon the inevitable high-speed crash this newb was bound to cause. I can report with absolute certainty that this is one tough little bugger. My inital squirrely attempts to fly it was in my living room and I had no idea what I was doing. 4 or 5 high-speed impacts with ceiling, wall and furniture later, I figured our how to “feather” the power and became comfortable with the controls. Price: Sure there are less expensive quads but from the extensive (about 10 minutes) research I did, this is one of if not the least expensive FPV-capable quad. There are several others with integrated cameras but they don’t support FPV. Parts! : As a newb, I’m not sure about other manufacturers but I was very surprised by the depth of the parts support from WLToys. You can literally purchase any part for this thing: not just the typical breaking parts like blades but also body, gears, motors, led lights and covers, and even a replacement circuit board! Wind: Obviously this ain’t no Phantom. Wind (even a decent breeze) is problematic for the V686. In the video of the inaugural flight yesterday late afternoon, you’ll see I was struggling with the breeze a lot. After recharging the battery I took it up again after dark. The breeze had kicked up a bit more and I almost lost it when I was about 80 feet up and a gust sent it over my neighbor’s house. Luckily it crash landed right between my neighbor’s house and the other on the other side and I was able to recover it easily. Lesson learned. My flight this morning at the school down the street (second video) had almost no wind and was a lot easier to control. Bottom line: The V686K is rad and totally worth the price. I can’t imagine a better entry-level quad option for folks looking to dip their toes in the whole drone/quad rotor thing.